Lucy can't wait for the new coding club at school to start. Even though she's only in sixth grade, she has an idea for an app, and is excited to get started on it. But Lucy's excitement turns to disappointment when she shows up at the first meeting. Sophia is there--she and Lucy had a fight over the summer and they are now ex-friends. There's also Maya--a very cool seventh grader who Lucy's never dared talk to. And then there's Erin--a new girl who nobody really knows. Not only does Lucy not get to work on her brilliant idea for an app, she also ends up working with Sophia, Maya, and Erin to discover the meaning of some mysterious notes that are in coding language. 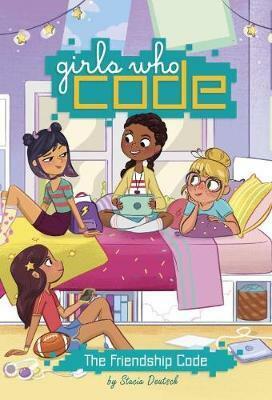 Lucy and the rest of the girls soon discover that coding takes time, patience, and dedication--and so does friendship. Imprint Grosset & Dunlap Inc.,U.S. Team BFF: Race to the Finish!